An early UK hobbyist/home computer based on the Zilog Z80 processor. On Saturday April the 21st 2012, during a visit to the UK National Museum of Computing, a Raspberry-Pi vintage 2012 met a NASCOM vintage 1978 for the very first time. Same day I was there too, I thought the picture looked familiar. 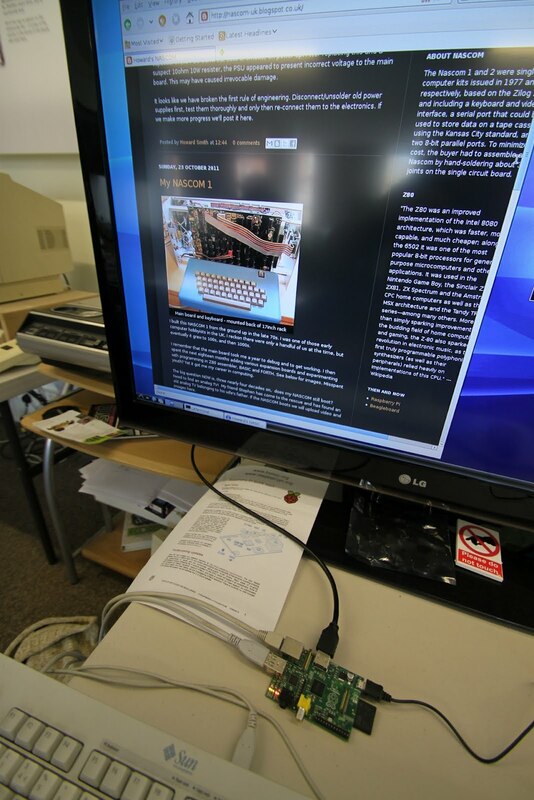 The Nascom 1 and 2 were single-board computer kits issued in 1977 and 1979, respectively, based on the Zilog Z80 and including a keyboard and video interface, a serial port that could be used to store data on a tape cassette using the Kansas City standard, and two 8-bit parallel ports. To minimize cost, the buyer had to assemble a Nascom by hand-soldering about 3,000 joints on the single circuit board.